Welcome! Congratulations for taking this conscious step to apply for admission into the New Earth Theological University (NETU). Complete the online NETU Application for Admission below. ​NOTE: A one time, non-refundable $100 Application for Admission fee is payable to New Earth Theological University at the time of this application. Applications for admission will not be processed without the application fee. When finished here proceed to the Tuition and Fees page and complete your application. Instructions: Please be advised this form may require 30 minutes to complete. We highly suggest you read through the application carefully - first - before attempting to complete the process. This will help ensure that you have all the documentation required, available at the time of filling out this form. We suggest that you set aside sufficient time for this process and do not close the browser until successfully submitting ALL required information. Do NOT use ALL CAPS except for initials and possible abbreviations. Read through this application first as you will be asked to Scan and Upload documents. NOTE: Where indicated below in RED, Scan and Upload only one (1) single PDF document containing ALL of your assorted documents and items, like diplomas, transcripts, reference letters, etc. If you have more than one document to upload, please use the additional File Upload features below. Make sure ALL is ready before starting. Gratitude in Grace for choosing to study at NETU. ​NOTE: TO PhD PROGRAM APPLICANTS: If you are applying for the PhD program YOU MUST UPLOAD A THESIS STATEMENT WITH YOUR APPLICATION for the research project you will be proposing. An academic advisor will assist you in developing your formal Proposal once you are accepted into the program. Applications for admission to the PhD program WILL NOT BE PROCESSED WITHOUT AN UPLOADED THESIS STATEMENT. - Students transferring from Metropolitan Theological University must upload their Metro Admissions Letter with Student ID# and Metro transcript. Students without an official Letter/ ID# and transcript will not be transferred to NETU. In that case, please be advised a one-time, non-refundable $100 Application for Admission fee is payable to New Earth Theological University at the time of this application. Use the "Upload File" feature below. IMPORTANT: Scan and Upload only ONE (1) SINGLE PDF Document containing ALL submitted documents and items. If you have more than one document to upload, use the additional File Upload features below. In the space provided please include a brief autobiographical statement. 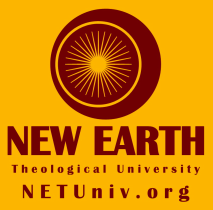 Include the people, events, and books which have influenced you, your thoughts about spirituality, your particular faith tradition or spiritual path (if any), any special interests or hobbies you have, why you consider NETU to be a good match for your new-paradigm theological education, and what influenced you to apply today. By placing your name in the box below (electronic signature) you certify that you have read and accept the About, Admissions, Accreditation, Admission Requirements and Tuition pages on this website.